I no longer offer pattern support for this pattern, however feel free to use it. This pattern remains protected under copyright. Special notes: I worked in continuous rounds with a 3.75mm hook and worsted weight yarn. Have any questions or if you come across a mistake in the pattern please leave a message in the comment section below. 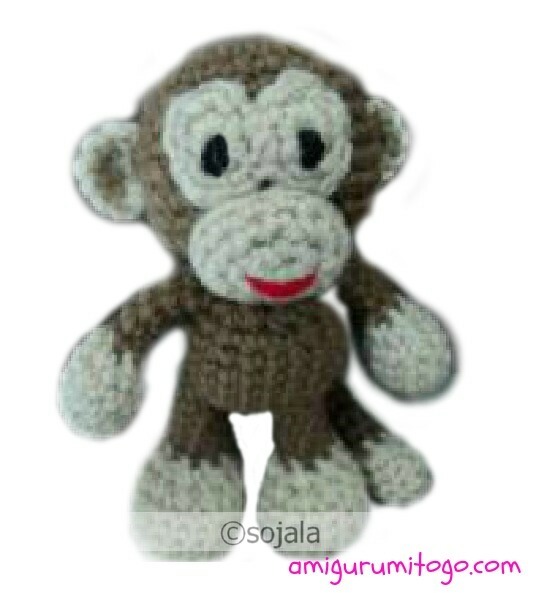 This pattern will give you a monkey about 5 inches tall depending on your choice of yarn and hook size. This pattern has a video to help you if you are new to amigurumi. *Remember if you use safety eyes to put them in after you make the eye patches and before closing up the head. *** stuff head while pushing the stuffing into the sides of the head as you stuff. Please read tip under row 13 before continuing on with row 13. TIP *** If you use safety eyes, they need to be put in after your eye patches are sewn on. If you use yarn for the mouth, put that in before sewing muzzle on the face. The muzzle can be partially sewn in place then stuffed to make things easier as well. 6) sl st into next st and finish off. Leave long tail for sewing. 3) sl st into next st and finish off. Leave long tail for sewing. 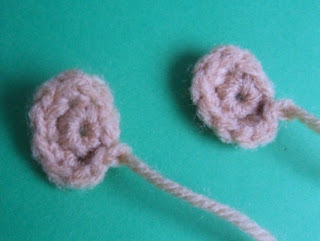 TIP *** stretch out the eye patch with your fingers to get a nice oval shape, then sew the 2 patches together as pictured. 9-13) 1sc in each for 5 rows (9) sl st into next st and finish off. Leave long tail for sewing. 7-10) 1sc in each st for 4 rows. No need to stuff arms. 3) finish off, leave long tail for sewing. These monkeys are so adorable! I'm really tempted to make these for one of my daughter's classes, but I'm not sure if I'll have the time to complete them before the end of the school year? Regardless I'll be making at least one of them. They are so adorable. Thanks for sharing the pattern. I think I'll start right away to make one.... Thanks~!!!! Every time you create a new tutorial, I am so excited and want to crochet along. Thanks for sharing! I am the anonymous comment above...I love your tutorials. Nice to know who I'm talking too as well, thanks again! Love Your Little Big Foot series. Would you happen to have a pattern for a loin or tiger? this pattern is so beautiful!! I think I'll crochet it :D thank you!! You're very welcome Liz, so glad you like them! Thanks for sharing your patterns! Your creations are very cute!! i think i'm ginna try this.. So glad your mom loves the monkeys! Are you going to make her one? Awesome Monkey! and animals. My girls love monkeys, they are 3 & 1/2 yr old twins. So its taken me 10 days to whip one up with no prior experience..and of course it shows. THANK YOU for your online tutorials! However, my crochet has improved 500% I started with the head, body, legs, arms then tail. WOW the arms and tail almost look correct! She's over stuffed, head is funny looking, one leg is bigger then the other, one ear looks like I've put it on back to front! Doesn't matter, Piper loves it even more! I just have to sew a skirt onto it for her.. I'll send you a pic, somehow! I'm pretty happy with my first effort, you wait for the next one! awwww, I am so happy to read your message this morning! That is how I started out by watching online tutorials. My heart was over flowing when my children fell in love with my 1st crochet efforts, nothing beats that feeling! You have one of the best, if not the best website I have ever seen. All of your patterns are explained in beautiful detail and thoroughly demonstrative. Thank you so much for making it so easy for us all. Thank you very much for the most awesome feedback, I sure do appreciate it. This was a great way to start the day! All the best to you and yours and of course, Happy Crocheting!! With this pattern, I used black as the main body color and brown as the secondary color, left off the tail and I had a gorilla. Thank you for all of your wonderful patterns! I was so glad to find this pattern; I wanted to make a monkey plushie to send to my friend for Christmas. I started this afternoon and by bedtime I had a finished monkey! It looks a little wonky as it's my first time ever actually crocheting anything, and it's twice the size it should be because I used thick yarn & a bigger hook but it's definitely monkey-like. XD thank you for your patterns! Will you be making a dog/puppy anytime soon??? I cant see anywhere where is says what size hook to use for this pattern? Its so sweet I cant wait to make it for my grandson ! Hi Anita, that info is in the special notes section under the abbreviation list at the top... it's a 3.75 or size F (USA) and worsted weight yarn (#4) Thanks for asking! I really enjoyed making them your instructions were easy to follow. Hi Annie! I'm so glad to hear that and you are very welcome! Do you think that you could make a pattern like this for a panda? Oh, maybe in the New Year? My daughter is 10 and has started crocheting. I came across the monkey on youtube and she has so far done the head, body and one leg. I just came across this website today so she hasn't seen any of the other patterns yet. She is going to flip! Thank you so much, she is having so much fun. One question I have for you is when you reduce in the feet are there suppose to be large gaps or is she doing something wrong? I notice yours gaps a bit too but it seems to be alittle tighter than hers. Hello Mike! I'm so happy to hear your daughter has picked up crochet and using my pattern to start with, so awesome! I crochet rather tightly using worsted weight yarn (medium #4) and a 3.75 mm hook(US) I believe the hook size would help reduce the gap size along with crocheting a little tighter, however, there will be some gap and that's completely normal. I hope that helps! And thank you so much for the message it was great hearing from you. Hi Debs! I don't mind at all. Your monkey is perfect, you really did a great job! Love his button eyes too. If you get the chance I would love to see him posted on my facebook page, Amigurumi Freely. If you do share him there I will put him in my newest album featuring other peoples works and add a link to your blog there. Thanks again for letting me stalk your blog! So glad to read your comment today, thank you for taking the time to write, I do appreciate it. I hunted high and low for a good monkey pattern and fell madly in love with these guys!!! I made one and am hooked... I may have to make a few more! That is so awesome! I'm glad you found the pattern :) I was just over at your blog and you did a really great job on him! Love him lots and thanks for sharing. awww, sounds super! If you can please post a picture on Amigurumi Freely on facebook, I would love to see! Hello these 2 are soooo adorable have to make them but only 2 problems,firstly i only have either 3.50 hook and 4.00 so which to use plus can i double up DK wool i'm here in UK and our wool not as thick as ur worsted so just wondered! Hi Wendy, either one of those hooks would work fine. I would use the 4.00 hook tho if you are doubling up on the yarn. If doubling the yarn gives you thicker than worsted then a 5.00 hook would work even better. The only thing that will happen is you will get a slightly larger monkey. Your monkey is so cute, unfortunately I am not able to download the free pattern. My computer has given me a message that this website can transmit malicious software or has been involved in online scams or fraud. Can you please work out a way of allowing me to obtain such a great little pattern. Hi Karen, I just investigated why you would be getting such a message. First I tried the print friendly button with my firefox browser and there was no warning then I tried it using Chrome and yes there was a warning but it is a general warning that PDF files could harm or change your computer but that is a general warning given for use of any PDF. I did some research on the Print Friendly and found no evidence that there has ever been a harmful virus come from them and no issues reported at all. Hope that helps ease your mind. I love this monkey. This will be my 1st animal. My grandaughters bday is in a few days,she will be 3, Going to try to make it. Ty for the pattern being free.You are very blessed with talent. I am so happy to read your message tonight! Thank you very much for taking the time to comment. I really appreciate that and I'm so glad you are finding the videos helpful, it means a lot to me! All the best to you and happy crocheting!! I just started crocheting a month ago and i love your bigfoot patterns!! I made the elephant already and it looks absolutely cute! !thank you soo much for this free pattern and the video tutorial. I want to make the monkey next, but before that i have a quick question. For the monekey, under "MUZZLE with alternate color:" Row #4, what does BLO mean? I really appreciate your effort. Hello there! Glad you like the patterns. I was shocked to find that I don't have the BLO abbreviation and meaning at the top of the pattern so I just corrected that to show BLO means back loops only. If that gives you any trouble I do cover that step in the video tutorial. Thanks so much for asking! I'm so impressed with your both your teaching (from a teacher!) but most especially your generosity. We'll pay it forward by making these little creatures for our Charity Mission Fair. And thanks for the TOG way of decreasing. thanks for all your crochet patterns they are so easy to make and adapt. Its so cool to find a good FREE pattern. I have made the monkey and bear i also worked out how to make a penguin they are all so cute. Thanks again, my house is gonna be full of Little bigfoot toys in no time - woo!!! How wonderful, I'm so happy to read your message :) I'm so glad you are enjoying the patterns and even came up with a penguin your own. I love penguins!! Have fun and of course Happy Crocheting!! LOVED this pattern!! So cute!! :D I made a few changes while making it: 1) when I finished with the head, I went ahead and started on the body on round 2 of the body pattern to give the monkey more of a neck. 2) For the tail I made it all in the main color and a bit thinner and stuck a pipe-cleaner inside so you can mold the tail into different shapes :) 3) I made duplicate of the ears in the alternate color with the main color and attached them to each other with 6 slip stitches around the top, this makes adorable little ears! I made this monkey in one day and can't wait to give it to my friend as a gift tomorrow!! =D Thanks SO much! Can you direct me to where online I can find the eyes you used for this monkey? I have tried looking everywhere online but have no such luck. Thanks. the eyes in the pictures in this written pattern are just yarn. The eyes I used in the video tutorial are oval buttons I found in a fabric store. The safety eyes I use in my other Little Bigfoot patterns are found online. Google, "Lisa & Ed's Eyes and More" and then click on animal eyes. Thanks for asking! Hi Sharon. Thank you so much for your free patterns. Although I don't know English very well, I can easily apply your patterns. My one year old baby adores the monkey. it is very cute. i want to send you the pictures of my crochet animals when i have tried and finished all of them. Thank you very very much:)) bye..
Hi!Thank you so so much for this pattern!I'm in the process of making the monkey and I'm still at the head part,but I'll keep going ^_^ I was also wondering if you could post a little bigfoot panda? With the same size as the monkey?Please and thank you! !God bless and keep up the good work!! This pattern is gorgeous! Thank you for sharing. Hi...love the monkey. I recently started crocheting and have learned a lot. I have a question I hope you can help me with. I know how to do a magic circle, but have problems sometimes, so I found an alternate way with the chain 2. My question is...would it be the same to chain 3, join and make your stitches in the loop? I noticed some patterns call for chain 3, join, etc. Hi Yolanda, first of all I am currently revising this monkey and he is getting a new and improved video tutorial. It should be ready in the next few days, I'm actually editing the video tonight. I'm not sure what you mean by ch3 and work st into the loop. Normally you ch2 and work the st into the 2nd ch from the hook. I have a video tutorial on this. I can't link it here but scroll up the page and look to the right hand side for the label list. Click on the label "adjustable loop" and 4 posts will pop up. Click on the post that reads "adjustable loop chain 2 method".